Satisfy your itch to stitch with this comprehensive treasury of tips, instructions, patterns, and projects! It's amazing that a simple hook and yarn can yield such diverse results, from thick, cozy afghans to delicate lace doilies. Crochet: The Complete Guide contains everything you need to get started or take your projects to the next level -- from advice on selecting the best yarn types and colors for your projects, to easy-to-follow instructions for creating sophisticated edgings, lacework, and three-dimensional textures, to multi-color effects, ruffles, flowers and much more. 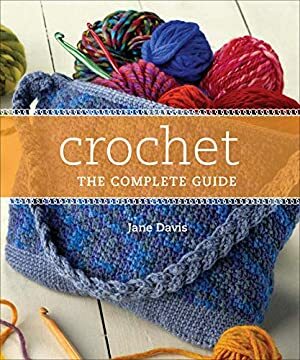 You'll find 150+ illustrated stitch patterns, from classic patterns to new and unusual designs arranged by type and style, and color-coded for easy browsing directions for a wide range of crochet styles, including Tunisian crochet, beaded crochet and CroKnit. Also included are seven timeless projects to make as shown, or customize by substituting pattern stitches found throughout the book -- a getting-started section that covers tools, materials and basic techniques. Log In to track Jane Davis on eReaderIQ. to be notified each time the price drops on any book by Jane Davis. to stop tracking Jane Davis. We started tracking this book on August 28, 2011. This book was $16.49 when we started tracking it. The price of this book has changed 58 times in the past 2,793 days. This lowest price this book has been offered at in the past 90 days is $2.51. The lowest price to date was $1.99 last reached on December 24, 2018. The highest price to date was $22.13 last reached on March 8, 2018. This book has been $22.13 one time since we started tracking it.